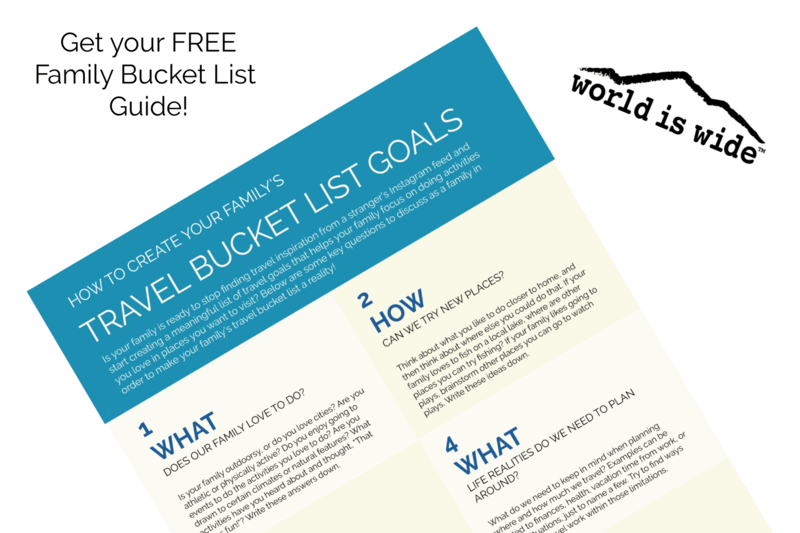 I know I talk an awful lot about creating family travel bucket list goals and how our family has specific travel goals. 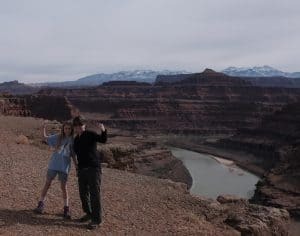 So it seems a little counter-intuitive to tell you that we recently returned to Moab, Utah for our fourth time. (It was our third time as a whole family. My husband and I went once before having kids.) 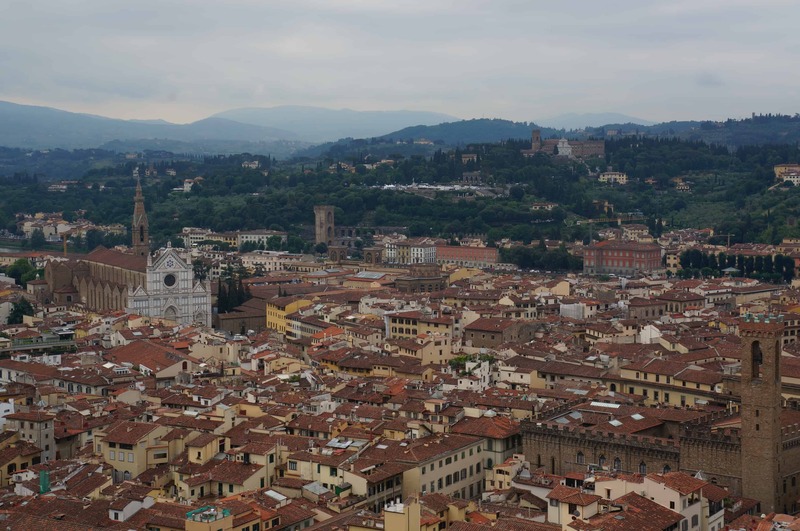 Yes, we want to diligently check off new places on our bucket list. 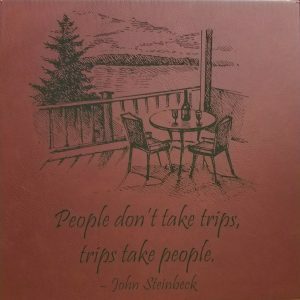 But it’s also OK to have a favorite place that feels like a special place to our family. For our family, that place is Moab. Moab has so much going for it. Warm desert air. Amazing, sweeping desert landscapes. 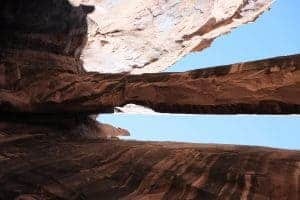 Unique arch formations that are rare to find anywhere else in the world. 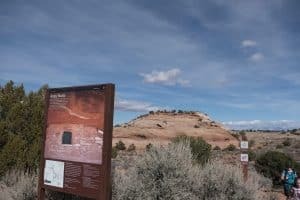 Opportunities galore for hiking, mountain biking, off-roading, zip lining, viewing American Indian rock art, seeing dinosaur tracks and remains… The list goes on and on. After six days spent at a place we’ve visited several times before, we still left feeling like we didn’t get to do all that we wanted to experience. 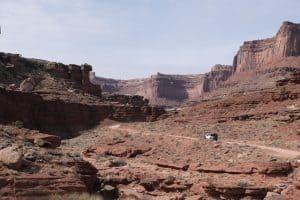 Here is our experience on our latest trip to Moab. 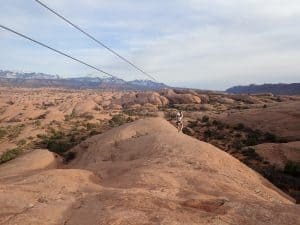 Our overall goal for this trip was to experience some of our favorite places in Moab, while also trying some new things. The balance of familiar and new is a hard one to strike when revisiting a favorite place. Moab is a town of about 5,000 permanent residents, but in the busy seasons it can contain up to 30,000 people. It has really developed its tourism infrastructure immensely since my husband and my first trip there in 2003. One of the guides on our adventures said they are building about three hotels a year. 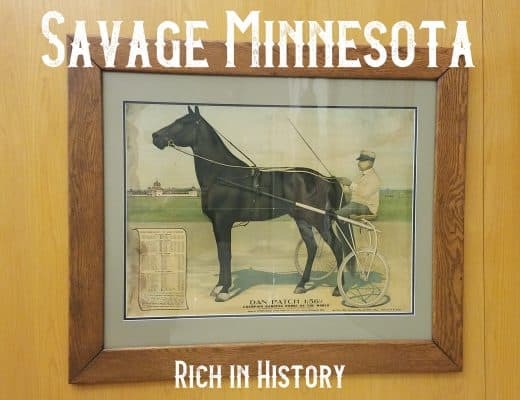 It still manages to have small-town charm and is a draw for families, young adults (we were there during spring break), and adventurers of all kinds. Pro tip: For families traveling to Moab, there is a ginormous sand hill just north of town on the west side of the main highway. 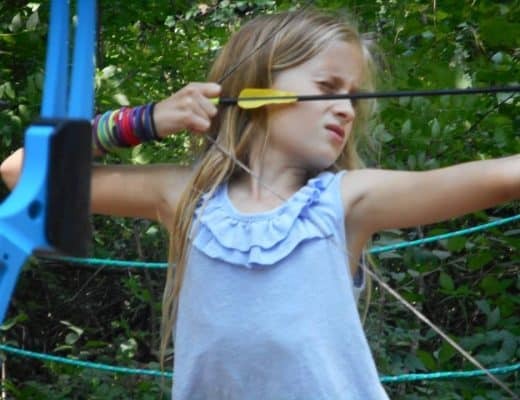 It’s on public land, and it’s a magnet for kids. This is an outstanding place to take kids to let them run up (and roll/slide down) the hill. Even our 14 and 10 year olds love this place! 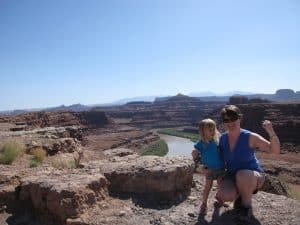 As we often do on our trips, we stayed in a vacation rental in Moab. 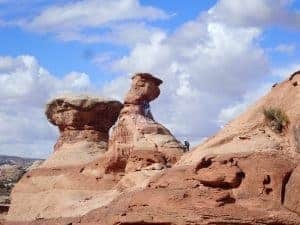 At the south end of town is the Moab Golf Course, and on that golf course is a large number of town homes, many of which are clearly vacation rentals or seasonal homes for people. There was not one Utah license plate in the parking lot outside our town home. It’s a great place to stay, but be forewarned that golf courses can be dangerous. Our daughter was sitting on the back patio, which was just off a green, and she was almost hit by a golf ball! We have been to Moab four times: in March (twice), May and October. I can’t stress enough how much I would recommend going in the spring or fall, versus the summer. This trip was in March. Our highs were in the upper 50’s to lower 70’s F. We were really hot on hikes. I can’t imagine trying to tackle this heat and the crowds in summer. The guide for our rockaneering adventure also happened to be a local Emergency Medical Technician, and he had endless stories of people needing rescue in the summer because they tried a three-mile hike with a half-bottle of water. Whatever time of year you go, make sure you have plenty of water. Also know that Moab has events throughout the year in Moab, the biggest of which is their Easter Jeep Safari. 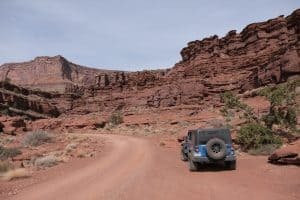 Jeep drivers from around the country (maybe the world) descend on Moab the week before Easter through Easter Sunday for this event. If you’re not a fan of crowds, I would avoid this time of year. Having said that, my cousin and his wife just went over the Safari week and seemed to have a blast. 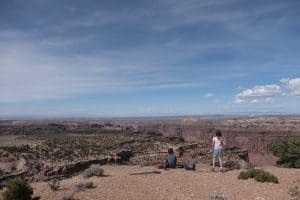 We had driven the Shafer Trail before, when the kids were little, so we thought it’d be fun to take the kids on a more memorable drive on this iconic road. 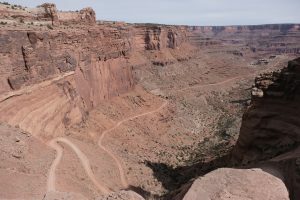 It’s a rugged 19-mile road that, when taken from the Moab area, ends within Canyonlands National Park’s Island in the Sky district, near Dead Horse Point State Park . While it’s not technically that challenging as far as off-road adventures go, you definitely want to be driving a vehicle with some clearance under it, preferably 4-wheel drive. My husband drives a Jeep Wrangler, so we were pretty set. There were not a lot of vehicles sharing the road with us, but you may find it encouraging to know that it is a somewhat traveled road. In good conditions you likely won’t be the only one out there. The reason to drive this trail is to see the amazing views on the road less traveled. 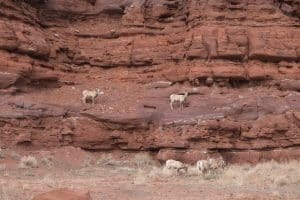 We even saw big horned sheep on the drive! The kids were a little freaked out by the drive, but overall I think they appreciated it for the adventure it was. 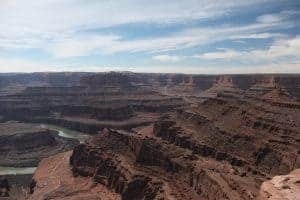 If you’ve seen any movies with scenes that take place in the Grand Canyon, chances are they were actually filmed at Dead Horse Point State Park, as the views are strikingly similar and access to a state park is much easier for film crews to attain than at a national park. 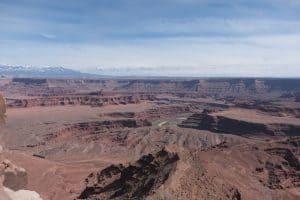 When you see the views at Dead Horse Point State Park, it’s hard not to be awed. It’s got to be one of the most beautiful state parks in the United States. We only did a little exploring here, as the kids were kind of tired. 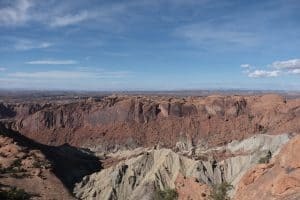 You can hike a loop all the way around to see both sides of the park, which would afford you some pretty amazing views. 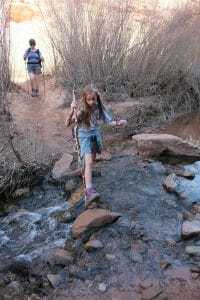 This trail is one of our favorite hikes in Moab. I write about it in more detail in this post. I highly recommend checking this trail out, especially if you are traveling with a dog. Our dog loves this trail, though she’s a little too old to actually finish it. While hiking in a beautiful canyon you get to cross a creek (many times), enjoy a bit of shade here and there, and the reward at the end is a beautiful arch, Morning Glory Arch, which you get to go right underneath. Just an awesome hike. 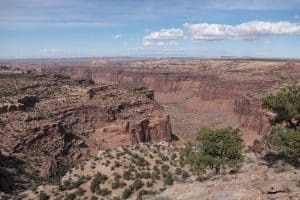 I also wrote in more detail about our brief but awesome visit to Canyonlands in a separate post. Canyonlands probably doesn’t get as much love as Arches National Park, mostly because Arches is so conveniently located a few miles north of Moab. It’s probably an hour drive to Canyonlands from Moab, but it is most definitely worth it. 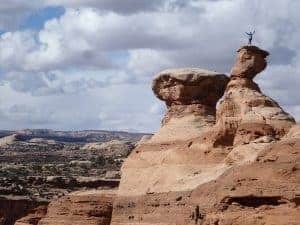 It has spectacular views, unusual formations, ancient Puebloan ruins, and the ability to get a panoramic view of the park from Aztec Butte. It is not to be missed! Mesa Arch…just an amazing view! 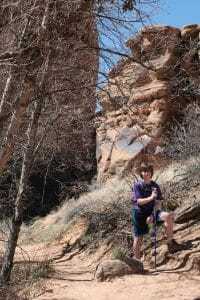 Our son’s 14th birthday happened to fall during this trip, and his choice was to visit Arches National Park. Our main hike that day was with the rest of the masses, to Delicate Arch. Delicate Arch is the iconic arch you see photos of when you hear about Arches National Park. It is a wonder to see in person. 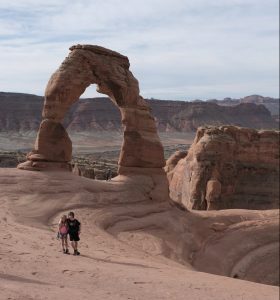 Know that the hike to Delicate Arch is not one to take lightly. There is quite a bit of ascent to get to the arch (and you can get right up to the arch, if you choose…be prepared to wait your turn for a picture). There are also some rather perilous edges. We watched a woman almost not able to stop herself from going over a pretty serious dropoff. Someone in the parking lot asked us if we thought their stroller could make it on the trail. The answer is a definite no. But the payoff is fantastic. Delicate Arch is so amazing. Because we were nearing the end of our trip and were tired from adventures the day before, we settled for driving with the other masses of people through the park to spy some of the other arches. 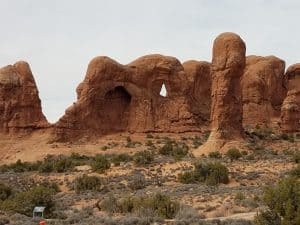 This was not our first trip to Arches, so we weren’t as diligent as we have been in prior trips. 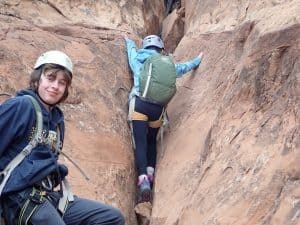 This was our second time patronizing Moab Cliffs and Canyons for a family rockaneering adventure. (Note: We did not request, nor did we receive, any complementary or discounted fees for this experience. They did not know I am a travel blogger.) Since we had done rockaneering at their normal site before, we asked if they could take us on a similar half-day experience in a different location. They definitely delivered. Our guide, Chris, was fantastic. 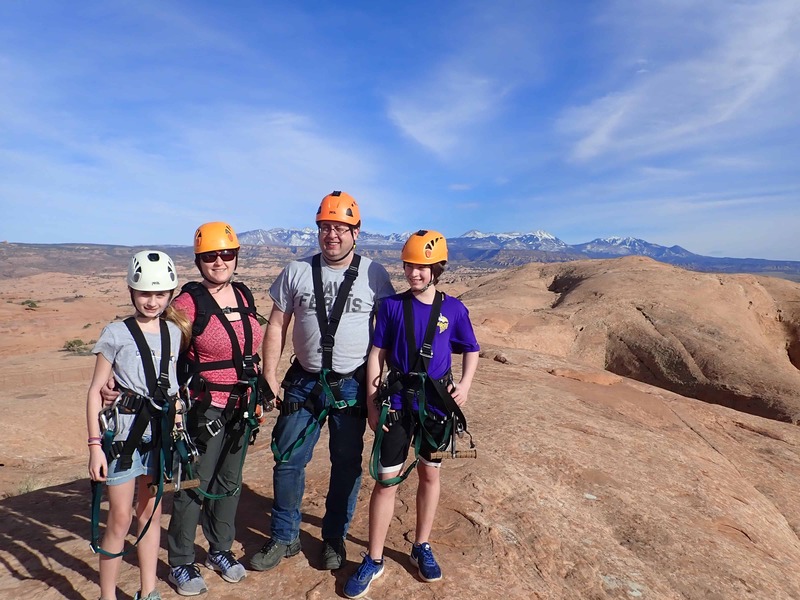 He guided us through some difficult (for us) terrain and talked my husband, not a fan of rappelling, through a very tricky rappel at the end. And our kids got to climb this! He could only take two people, and our kids were much more excited about the prospect than we were. 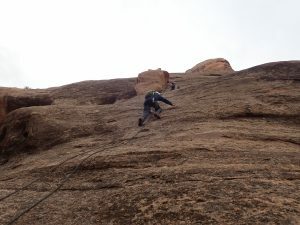 This climb was a pretty impressive way to end our last day in Moab. I really can’t say enough about how great the staff and experience were with Moab Cliffs and Canyons. One tip: bring a rain jacket or wind breaker on the trip if going in the spring or fall. The winds up where we were felt pretty brutal, and it actually did rain on us a little on our hike out. 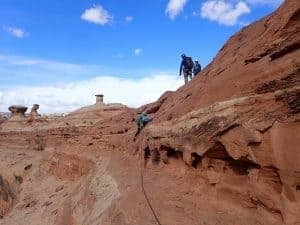 If you love natural wonders and adventure, and Moab wasn’t on your radar before now, definitely look into it. You can make it a luxury experience or a hard-core adventure sport extravaganza. As stated above, I am not a fan of ridiculous heat. I would recommend visiting the area in the spring or fall. 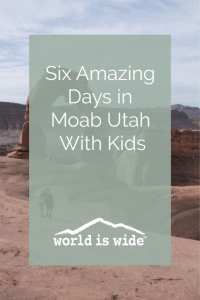 We haven’t even scratched the surface of all Moab has to offer, and we have been there four times! There is really something for everyone here. 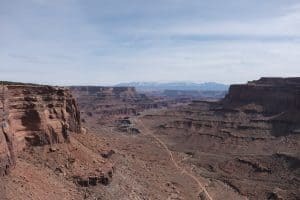 Dead Horse Point State Park is incredible, for the views, and for that name too! 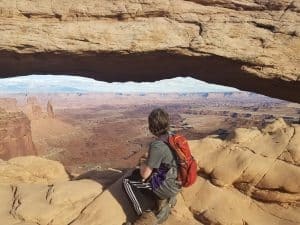 Moab is completely new to me, and I’d love to see this place, and try a hike for myself. The zipline is awesome, though I think I’d be quite scared to try! 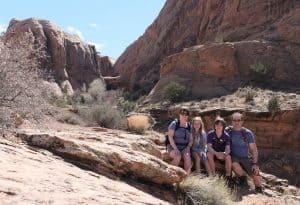 A lovely family itinerary! Thanks! Dead Horse Point is sadly named because (I can’t remember the whole story) horses were driven off the point to die. 🙁 But from a tourism standpoint it certainly sticks with people! It’s a really great area to visit. 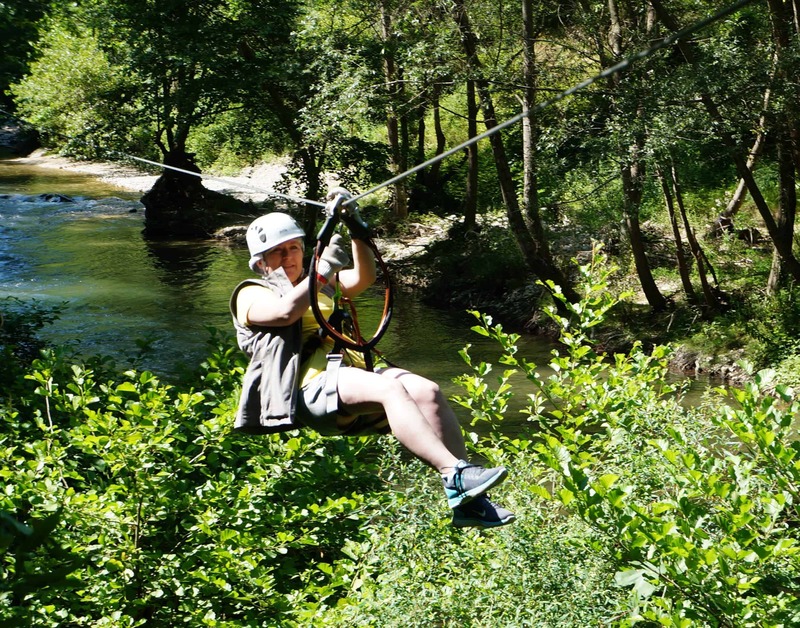 So many adventures if you’re not keen on zip lining (which I don’t find even a little scary…it’s so safe). Thanks Ritika! We really enjoy this area. You would love this place, then. So much to see and do, and amazing sights abound! This sounds like a fantastic trip, I would love to visit those national parks myself, they look stunning! And I would totally go for the zip line, I tried it ones in Nepal and it was one of the best things ever! Yes, this area is fantastic, and Utah has some of the best National Parks in the US. 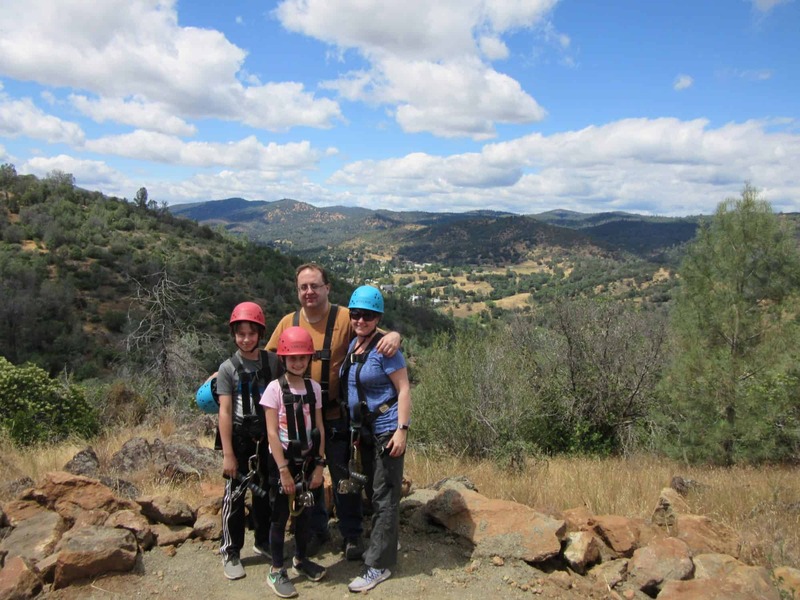 Zip lining is a blast, and this one has amazing panoramic views of the area, which made it even more fun. Love those photos. 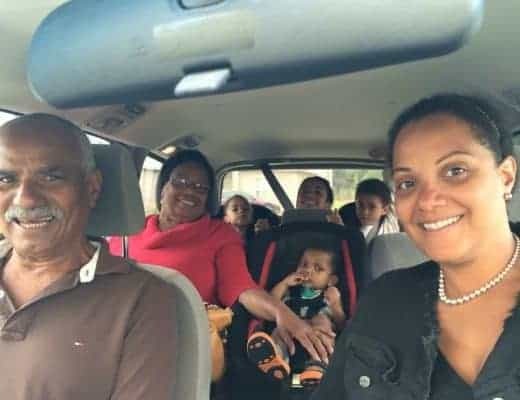 I think it is great that you travel so much as a family and yes, you are allowed to have a favorite spot 😛 😛 all of us do, you’re lucky that an entire family has the same favorite spot. I would love to zip line on Raven’s Rim 🙂 🙂 you always need a bit of adventure in your life 😛 Safe travels! Thank you! Yes, we realize that we are lucky in many ways. 🙂 Zip lining is so much fun. You should definitely give it a go! This place is really amazing! Watching photos and reading this post I really want to go there. Beautiful rock formations, I can imagine how I take pictures of them. ´That’s a cool place for a hike. Looks refreshingly new after all the green parks. Climbing part is something I liked the most. The desert really is fascinating when you’re used to green. I find it so relaxing. The climbing was fun. It was somewhat challenging (for us, as non-climbers). The kids really liked getting to go up that tower. My husband and I were fine watching them climb it. 🙂 There are some interesting climbing areas in that part of Utah. Wow this trip looks wonderful!! I would love to do that Zip Line adventure!!! I love the outdoors and this is one place I want to go this year!! Thanks Tif! I highly recommend Moab. There is so much to see and do in the area, and it’s all beautiful! And I also highly recommend Raven’s Rim Zip Line. They are very professional, and the lines are really fun (and of course, the views are amazing). I hope you enjoy it! I think it’s great that you have a special place that your whole family loves to travel and return to. I loved reading about it. I’m going to have to plane a trip there for my family. Looks like just the kind of place we enjoy traveling. Especially, the hiking! Thanks Caitlyn. Your family will love it. There is endless hiking, between the national parks and all the other public lands around there. I hope you enjoy it! Thank you for the visual treat 🙂 Love all the pictures. 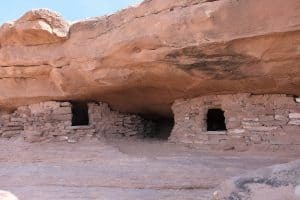 You have compiled the post nicely, I will definitely check out Raven`s rim if i ever go to Utah. 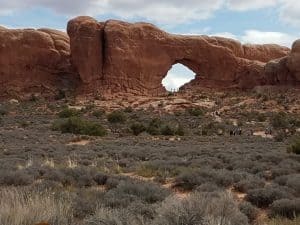 I have heard and read so much about Arches but never knew Moab was so close by! How wonderful that you have been able to find a place that is special to both you and your husband AND to your children. Looks like you have created some amazing memories! Love all the photos! 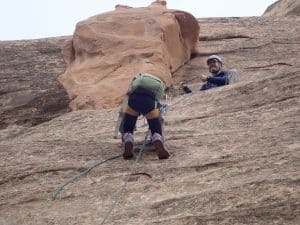 I’ve always wanted to go to Moab – knowing to go in the spring or fall is going to be extremely helpful in the future! Love this!!! Moab is on our short list!pinned this for later! It looks like you had a very awesome adventure! How warm is it in Utah? Our weather in March was anywhere from highs in the upper 50’s to the lower 70’s F. It probably got down to the 30s or 40s at night. Since we’re from Minnesota, that felt quite warm for March! 🙂 By later May it gets quite hot. It’s not like Arizona where many places are really warm year-round. I’ve never been to Utah, but this definitely makes me want to get there. I’m all about the outdoor activities, so this is all kinds of inspiring! I think Utah is a really under-rated destination for outdoor activities. It’s a beautiful state, top to bottom.They have five amazing national parks and so much other public land to enjoy. I think you would love it! Breathtaking views! Looks like a wonderful trip. I’d love to experience this with my kids one day. MOAB is on my bucket list! Originally, I planned to go with my hubby. Now I might drag my granddaughter with. Loved the pics!!! Thanks! You’ll love it. There is so much to see and do in the area. And it’s beautiful!